If you use your remote computer as a file server whether it's for storage or data security reasons, or simply find yourself having to upload and download files between computers frequently during a NoMachine session, a better solution might be to connect the disk, or drive. 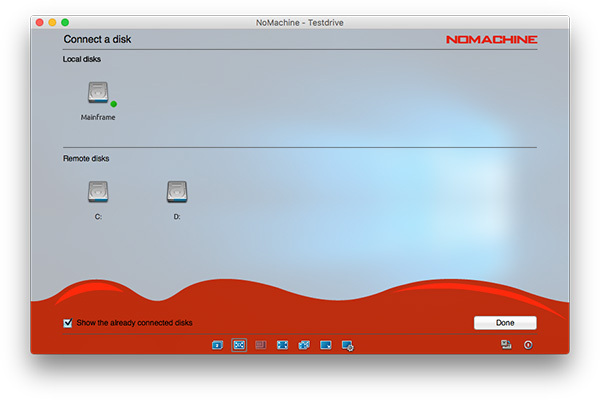 By forwarding a disk using NoMachine’s ‘Connect a disk’ feature, the contents of the remote or local operating system's disk are shared to or from the other computer. 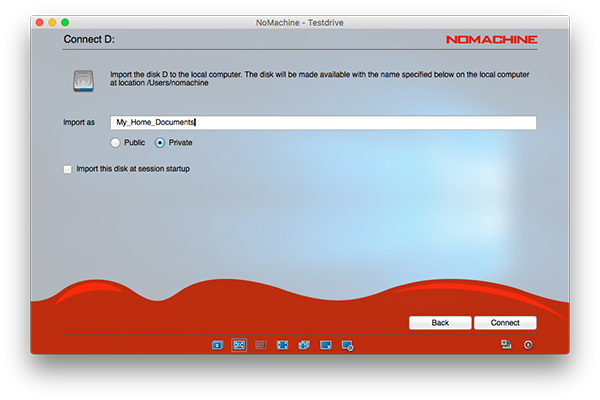 NoMachine lets you access any local or remote disk during the life of your remote desktop session. The remote and local systems can be Mac, Windows or Linux, it doesn’t matter. 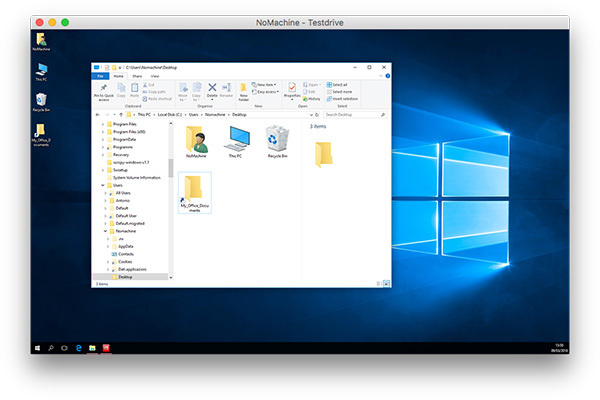 NoMachine lets you connect disk drives and access all the files and data on them for the duration of the session. 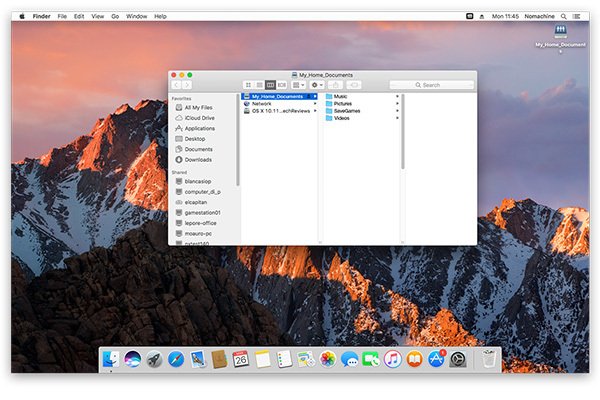 You can redirect local disk drives, including the hard disk drives, CD-ROM disk drives, and mapped network disk drives to the remote side, and vice-versa, meaning that the connected disk will show up in the remote or local file explorer (on Windows), finder (on Mac) and file manager (on Linux) depending on which direction you forwarded it. Connecting a local disk to the remote desktop allows you to access its content whilst you are connected to the remote desktop. Start a connection from your computer to the remote computer you want to access. Once connected, open the session menu (Ctrl-Alt-0). Go to Devices and click on 'Connect a disk'. Click on the disk you want to share e.g. the local Mac 'Mainframe' partition in Local disks (Fig. 2). Check 'Export this disk at session startup' if you want this to be automatically connected every time you run the session to the remote desktop (Fig. 3). You can provide a unique name for this disk or folder for easier identification (e.g., My_Office_Documents) in the 'Export as' field. The disk will appear with this name in the file manager of the remote computer. NoMachine also indicates the path to the disk so you can locate it easily. Click Connect, and check that a green dot appears next to your selected disk. Close the session menu and browse to the file manager, or explorer, of the remote desktop. You will see the local disk or drive you just shared in the list of available resources. 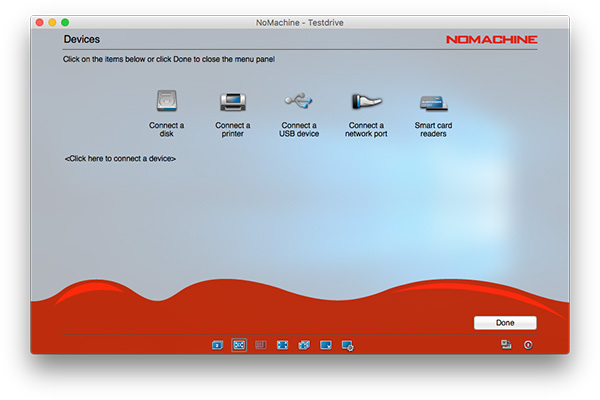 Connecting a remote disk on the host computer to your local desktop allows you to access its content from within the file explorer or finder of the local computer during the life of your NoMachine session. Click on the remote disk you want to share to the local file manager of the computer you are connecting from. In the example below, the disk to be shared is Windows 'D:' partition. Check 'Import this disk at session startup' if you want this to be automatically connected every time you run the session to the remote desktop (Fig. 8). If you prefer, you can provide a unique name for this disk or folder for easier identification in the 'Import as' field. This is optional. The disk will appear with this name in the local file explorer, or file manager, of your computer. You're done and close the session menu. Browse to the file manager, or explorer, of the computer you are connecting from. You will see the disk or drive you just shared in the list of available local resources.